In the latest move in what has become a prolonged legal chess game, Oak Bluffs selectmen on Tuesday unanimously agreed to refer the much-maligned three-story garage built by Joseph G. Moujabber on the North Bluff to the Martha’s Vineyard Commission for review as a development of regional impact. Selectmen agreed to a discretionary referral, meaning the commission will have 40 days to hold a public hearing on the three-story building constructed by Mr. Moujabber three years ago without a permit, to decide whether the project should be reviewed as a development of regional impact (DRI). The referral came after a flurry of legal activity surrounding the controversial garage project, dubbed by some critics the Garage Mahal. Two weeks ago, Mr. Moujabber appealed a decision by a Dukes County Superior court judge that annulled a demolition order for the garage and sent the project back to a town architectural board for a new review. On Sept. 6, both the town of Oak Bluffs and neighbors of the garage, Albert J. Read and Belleruth Naparstek, also intervenors in the case, filed cross appeals against Mr. Moujabber. The dispute dates to November 2003, when Mr. Moujabber received a town building permit to replace an existing 200-square-foot garage on his Sea View avenue extension property. The proposed cost of the replacement was $22,000, but less than six months later, the project grew into a three-story building with multiple balconies, sliding glass doors and a roof deck. The new structure sparked heated opposition throughout the neighborhood. Under pressure from town officials and neighbors, building inspector Richard Mavro, who later resigned on disability, revoked the building permit for the garage in May 2004, a decision the zoning board of appeals upheld later that summer. Mr. Moujabber since has filed several lawsuits against the town. The first — an appeal of the revocation order — was resolved last February, when both sides agreed to a superior court judgment that the zoning board and building inspector were correct in revoking the building permit for the structure. That decision by the Hon. Richard F. Connon marked a key win for the town and neighborhood because, had the court found in favor of Mr. Moujabber, he would have been entitled to keep the garage as it stands. But the more recent decision by Judge Richard T. Moses handed down last month was viewed by some critics of the project as a setback because it annulled the demolition order for the building, disputed claims the structure blocked views of the ocean, and ordered a new review by the Copeland District Review Board. The Copeland District in Oak Bluffs has been designated a district of critical planning concern (DCPC) by the Martha’s Vineyard Commission; and the Copeland District Review Board has special and board regulatory powers vested in it by the MVC. In his decision, Judge Moses took special note of the broad regional powers of the MVC and affirmed the Copeland review board’s authority to trump zoning bylaws, but also found that the review board did not provide specific feedback when they voted to deny the plans, and did not work with Mr. Moujabber to find some kind of a compromise. Michael Vhay, an attorney for Mr. Moujabber who filed the appeal of Judge Moses’ decision last month, said last week that the appeal was intended to be a placeholder, of sorts, that would keep his client’s options open and allow more time for the two sides to work out an acceptable resolution. Earlier this week, Mr. Vhay sent a letter to town building inspector Jerry Wiener that requested — as suggested by Judge Moses — additional guidance from the Copeland Review Board to assist in the design of the addition to the garage that was acceptable to the board. 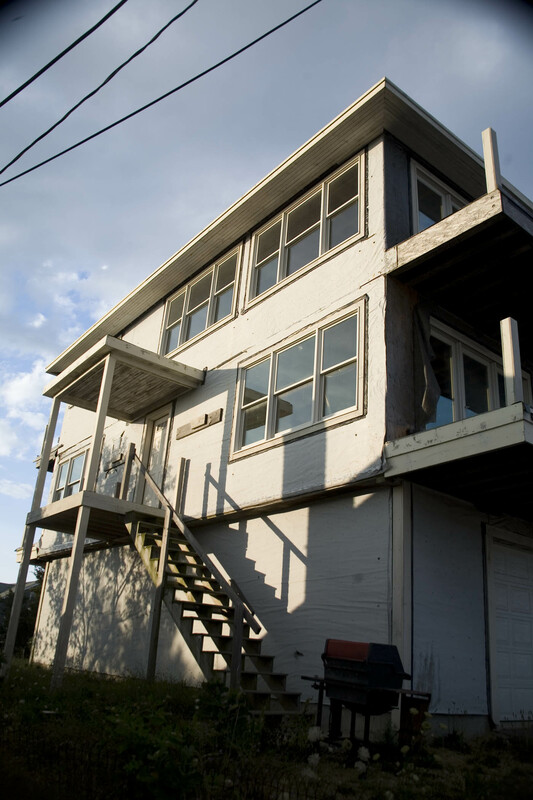 The letter asks for specific answers about things like the height of the building, curb cuts, a second story deck and balcony, screening, and several windows and doors. But with the selectmen’s decision Tuesday to refer the garage to the MVC, the review process at the local level put it on hold until the commission decides what to do. Although the commission may vote not to review the project as a DRI, early indicators are the project does meet the criteria for such a review. Paul Foley, DRI coordinator for the MVC, noted that plans to expand the Lookout Tavern directly next door to the garage did trigger a DRI review process last year. According to MVC regulations, any municipal agency in a town may ask the commission to review a project it feels might have significant regional impact. Many critics have long held that the Moujabber garage does have a regional impact because it obstructs views from the land and water where the ferry comes into the Steamship Authority terminal. Reached in his office in Boston Wednesday morning, Mr. Vhay said he was just learning that Oak Bluffs selectmen approved the discretionary referral for the Moujabber garage. He said his client had hoped to open a dialogue with the Copeland Review Board about a plan acceptable to both sides, but it now appears that plan is on hold. “We thought we could have talked about the specifics of the project; what the [Copeland] board liked and didn’t like about the plans, what should be changed and what could be changed. But this changes that . . . at least for now,” he said.